The Netherlands is one of the only countries in Western Europe that haven’t had to deal with a major terrorist attack by Islamic extremists just yet (unlike the UK, France, Belgium, Germany, Spain and most of the Scandinavian countries). Although there was a stabbing attack which wounded 2 American tourists a few weeks ago, no bombings or major shootings have taken place. 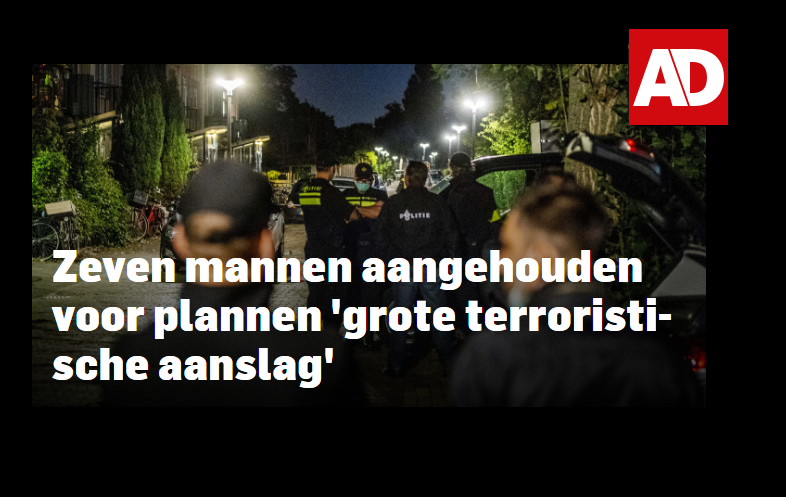 It would now appear that the arrest yesterday evening of 7 Islamic extremists who were in the final stages of planning an, according to Rotterdam police, ‘major terrorist attack’ made sure that statistic remains in place. Police say that the seven men had planned a terrorist attack involving guns and explosives. The group was trying to source AK47s, hand grenades and bomb materials to carry out their attack. All men are Muslims aged between 21 and 34. Some were even arrested previously for trying to travel abroad to join foreign militants. The man at the center of the group is a 34-year-old of Iraqi origin, who was convicted in 2017 for trying to travel to fight for the Islamic State group. All seven were arrested in the central city of Arnhem and the southern municipality of Weert on Thursday afternoon by anti-terrorism teams. Prime Minister Mark Rutte praised the country's Special Interventions Service (DSI). According to the Dutch prosecutor’s office, the main suspect wanted to target "a large event in the Netherlands where there would be a lot of victims". "The suspects were in search of AK47s, handguns, hand grenades, explosive vests, and raw materials for several [car] bombs." The plan was to carry out twin attacks involving a bomb and gun attack at a public event in central Holland and have a car bomb detonated elsewhere to detract attention. The National Coordinator for Counterterrorism and Security (NCTV) told local media in a statement that the arrests reflect the "realistic" risk of attacks in the country. The threat level in the Netherlands was raised to four out of a maximum five. Aaah yes, the religion of peace guys again…. Islam sure does love spreading around extra helpings of "peace." But by all means bomb Hezbollah who is fighting against ISIS in syria.